Foodie Films: Big Night Italian Round Up! 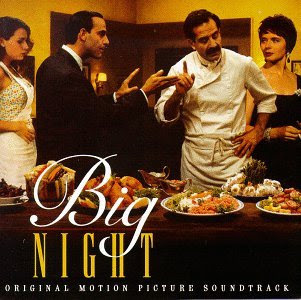 This month's Foodie Films blogging event was all about Italian inspired dishes in honor of the movie, Big Night. If you haven't watched the movie, I highly recommend you do and enjoy it with some great Italian food. It's a funny movie with a lot of references to food and running a restaurant - perfect for any foodie! I hosted a potluck Italian luncheon with friends before we watched the movie together and you can read all about it here. So what Italian dishes have been cooking in the kitchen of fellow bloggers? Check out these blogs to get their delicious recipes! Thanks to all those that participated in the Foodie Films blogging event this month. I encourage you to join in the fun in February where we're featuring French fare and fondue as we watch the movie, Chocolat! 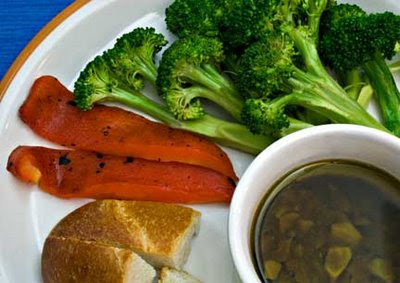 I'm on a veggie kick and Chris's recipe for Vegetable Pizzettes looks delicious! The individual servings are great for those with small families or single folks and the toppings are a great combination of flavors. Check out Chris' blog for details and the recipe! 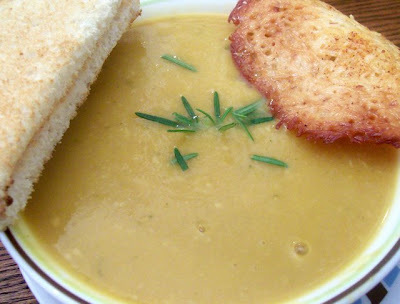 With the winter weather among us, a hearty bowl of soup just hits the spot! 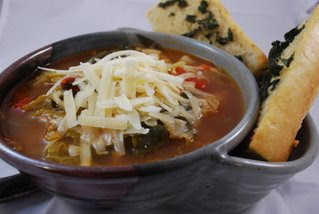 Lisa shares with us a recipe for Winter Minestrone Soup which looks hearty and flavorful - perfect for the winter! Check out Lisa's blog for the recipe and more pics of her adorable serving bowl! 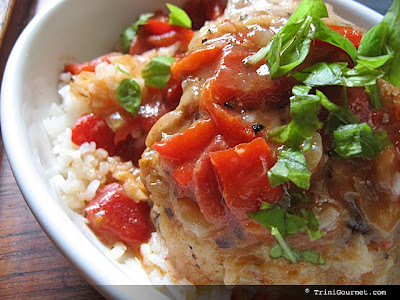 A traditional dish of Chicken Cacciatore is shared by Sarina for this event. One thing I really liked about her dish is the substitution she made for the flour called for in the recipe. Curious of what Sarina used? Check out her blog to find out and get the recipe while you're there! Laurie joins us from Alaska to share 2 versions of Bagna Cauda. Bagna Cauda is a specialty of Italy's Piedmont Region, which combines oil with anchovies and garlic to make a hot dip for vegetables and bread. Check out Laurie's blog for details and how she prepares them in 2 different ways! One of the best parts of Chicken Parmesan is the crunchy coating of the chicken. Melissa shares her recipe using panko breadcrumbs to get this fabulous texture. Check out Melissa's blog for the recipe to give this version a try! Amy joins us to share a recipe for Baked Pesto Chicken. I don't know about you, but i love pesto and it's delicious with chicken! I think the best part of the recipe is that it only calls for 4 ingredients. Curious of what they are? Amy's blog will have it all outlined for you with some great pics too. Click on her blog to check it out! Karen is pretty lucky to live where seafood is pretty abundant. It came as no surprise that she would showcase shrimp in her dish for this blogging event! 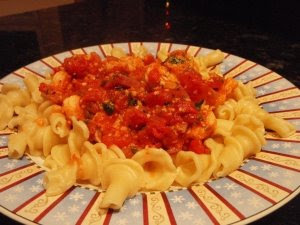 She shares with us a recipe for Shrimp Fra Diavolo. The dish tends to have a nice kick of spicy heat paired with the sweetness of tomato sauce. Check out Karen's blog for the recipe! One comforting dish I enjoy is risotto. 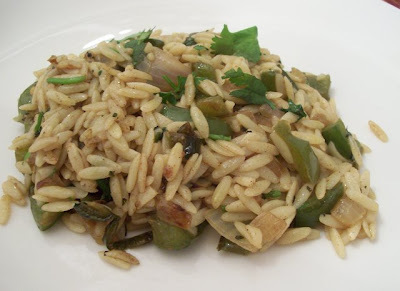 As you may know, rice is a weakness of mine in any dish and risotto is one that allows some versatility too. 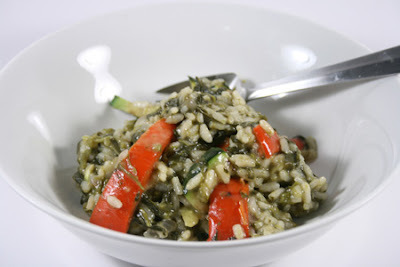 Emma shares with us a recipe for Spinach Risotto that adds a nice burst of color with red bell peppers! Check out Emma's recipe on her blog for details on how she creates this dish! One of my favorite salads is Caprese Salad... and Jessica has shared with us a recipe that makes this salad easier to eat! 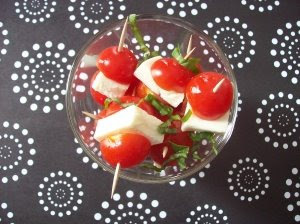 She puts the salad on a stick which is a great idea for appetizers or a simple snack. Check out Jessica's blog for the recipe! 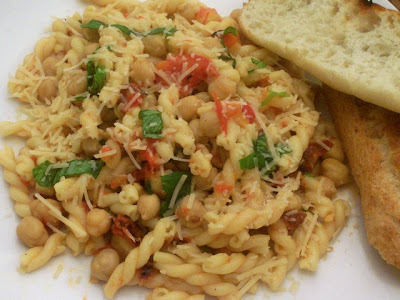 Supriya has submitted 4 delicious Italian inspired recipes to the event! 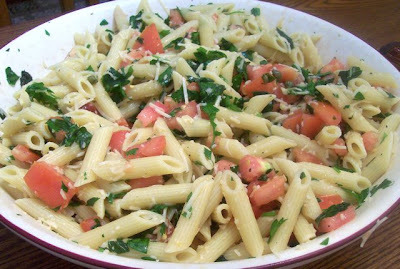 Each of them look delicious and can easily be made together for a nice Italian feast! Check out Supriya's blog for the following recipes! Meraviglioso! Wonderful round up. The chicken pesto and penne bruschetta are calling to me. Thanks for hosting such a fun event!